Channel incentive programs connect you to channel partners to boost B2B sales. Motivate dealers, distributors and contractors to move your product through your sales channel. Contact us about a channel incentives program to increase distributor sales! They are a great company to work with, very responsive to questions and customer needs. Channel incentive programs put you front and center in channel partners’ minds. Contractors, dealers or distributors are more likely to recommend your brand if you offer a fair price, quality products, excellent service and convenience. If you provide all these things at a high standard, great! But so does your competition. With so many companies competing for B2B customers, what many lack is a personally rewarding B2B customer experience. Channel incentives give your buyers a little something just for them when they purchase from you. They associate personal gratification and positive reinforcement with your brand, something good products and service can’t accomplish on their own. Our channel incentive programs are powered by advanced, flexible technology so you can easily manage custom channel incentive plans that help you meet your unique goals. Any of these channel sales pain points sound familiar? Meet our channel incentive programs solution. Your channel sales incentive program comes with a branded website that includes a participant portal, administrator controls and a rewards catalog. We invest in you with a free, 12-month promotional schedule that includes texts, emails, mail-outs and more. Most incentive companies make you pay extra for incentive program reports, wasting time and money, slowing down your sales and marketing strategy. This is where we’re different. You have 24-7, free access to your channel incentive programs report with us. Your ROI-certified account manager will always be by your side to help you interprets results and analytics or devise effective channel incentives strategies. We suggest these specialized modules for best channel incentive program performance. Easily manage a schedule of multiple, simultaneous sales promotions with different dealers, distributors, contractors, regions or departments. Make sales claims validation more efficient using an online document upload tool. Learn more! With the ability to access your loyalty program through mobile, B2B customers can upload claims, warranty registrations, invoices and more in an instant, wherever they are. Learn more! Show off the leading dealer/distributor reps or contractors to stoke some friendly competition. Learn more! Rewards make it worth your B2B customers’ while to pass quizzes or participate in daily trivia, consistently increasing their product knowledge in a fun way! Learn more! Games of chance like Spin to Win and Scratch Off make your loyalty program hard to resist, increasing participation and capturing attention. Learn more! Integrate your customer relationship (CRM) or learning management (LMS) system with your B2B customer loyalty program to build up customer data and get a more complete view of B2B buyer behaviors. Learn more! Divvy up manager roles, analytics for different regions, billing reports and more with this incentive program management powerhouse. Learn more! “Unmask” previously unknown B2B buyers by allowing open, uninvited registration into your program. Learn more! Here's How We Helped B2B Businesses Like Yours. Check out this channel incentive programs research! According to the Incentive Research Foundation, channel sales incentive programs can increase revenue by up to 32% — making them a “must have” for any business-to-business partnership! 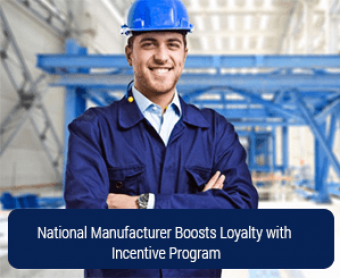 Aberdeen Group and Incentive Research Foundation studies indicate that companies implementing non-cash reward and recognition programs for their channel partners report annual revenue increases averaging 9.6%, compared to the 3% average of all other companies. An Incentive Performance Center case study of Price Pfister reported that the company achieved 173% of their stretch sales goals by using a channel sales incentive program. Channel sales and distributor incentive programs are the first step to establishing a significant differentiator over your competition. Over time, this differentiator turns into B2B customer loyalty insurance, because it creates lasting, positive sentiment and brand awareness. Rewarding channel partners for their loyalty and continuing business helps increase product knowledge, expand market share and develop more effective channel marketing and sales strategies.